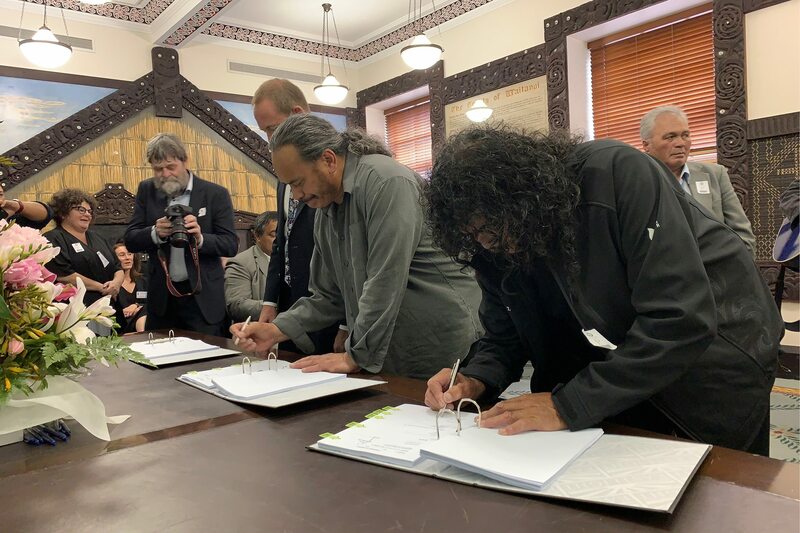 The Ruapehu tribes of Uenuku, Tamakana and Tamahaki, are one step closer to Treaty settlement. On Friday, 23 November 2018, Uenuku chair Aiden Gilbert and the Minister for Treaty of Waitangi Negotiations Hon. Andrew Little signed an Agreement in Principle (AIP) at Parliament. Ahead of the signing Mr Gilbert said the mamae (hurt) felt by others going through the settlement process was the same for the tribes of Te Korowai o Wainuiārua. Included in the Te Korowai o Wainuiārua agreement is an acknowledgement and apology from the Crown, cultural redress including a partnership agreement with the Department of Conservation and the vesting back of land within the Erua Forest Conservation area for the iwi to develop an eco-sanctuary and tourism venture at Pōkākā. The Te Korowai o Wainiārua core area of interest mainly consists of Crown conservation estate including the Tongariro and Whanganui National Parks that are being settled separately. A number of relationship agreements sit alongside financial redress of $21.7-million and cultural redress of $900,000. Crown owned properties including 183-hectares of Crown Forestry land at Erua and the former 500-hectare Waikune Prison will be purchased. National Park and Raetihi Schools and Police Stations along with the Landcorp farm Raurimu Station have been identified for potential purchase or transfer and leaseback. Historically the Crown has had very little contact with the Te Korowai o Wainuiārua tribes from the remote interior of the Whanganui District. With negotiations continuing, Te Korowai o Wainuiārua lead negotiator Chris McKenzie said discussions to confirm the historical account are yet to be finalised. These three blocks totalled a combined 715,000 acres. The Te Korowai o Wainuiārua negotiations team is now working toward finalising a Deed of Settlement with the Crown which they hope to initial by late 2019/early 2020.